Manchester (United Kingdom) (AFP) – Jose Mourinho has confirmed Manchester United club captain Michael Carrick will retire at the end of the season prior to joining his coaching staff as he pursues a post-playing career. The 36-year-old veteran has been plagued by injury and illness concerns this season and has been limited to one appearance, in September’s League Cup tie with Burton. 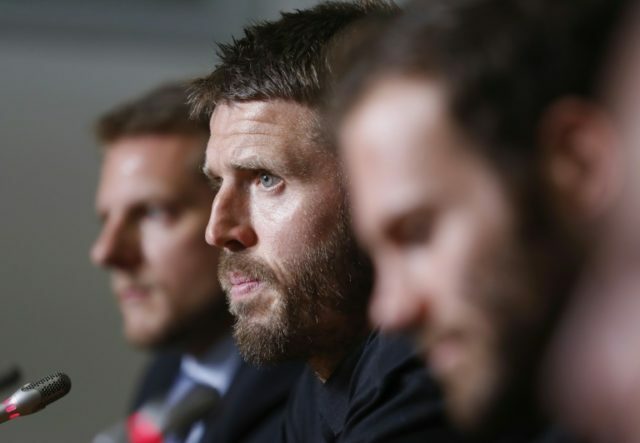 The former England international even underwent a minor procedure to solve an ongoing heart problem and Mourinho had already revealed that Carrick would be offered a coaching position with United’s first-team squad whenever he wanted it. Mourinho believes Carrick, who is back in full training, will return to the pitch over the second half of the season but also confirmed that the midfielder has indicated he wishes to accept a coaching role come the end of the campaign. “I think he will play again,” United manager Mourinho told reporters on Friday. “He has had a few months without even training so now he is in his second week of training with the team. “He could be a very important player for us. I think the decision to (retire) at the end of the season and not last week, I think is a good decision for the team and a good decision for him to finish playing football and not because he is injured or with some problem. Mourinho, who is poised to sign a contract extension as United manager, is already clearly putting plans in place for this summer at Old Trafford. And he admits United’s pursuit of Alexis Sanchez, and a proposed deal involving Henrikh Mkhitaryan moving the opposite way to Arsenal, is a break from the norm for him. “I think the idea of the transfer market in mid-season, normally I say that is to help clubs that didn’t work well in the summer,” Mourinho said. “I think that’s for me the point of the January transfer window, is to help the clubs that didn’t work well in the summer and they feel they have to do something in January to help what they didn’t do well before. However, as the Sanchez move progresses, Mourinho is insistent that the bid does not indicate an existing weakness in his squad but, rather, represents a move made with an eye on the longer term. “The team is lacking nothing,” he said. “It is not the point of lacking something or we desperately need something. It is just thinking about the improvement of the team in the future.